Did you know I wasn't the first Kitteh in our house? while their Moms and Dad were in LONDON. This is Bogey...he's got a real chance at winning, look at that FORM! He can really win with that "half on, half off" thingy he's got going on. 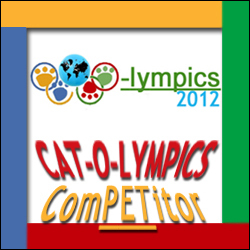 Smokey & Bogey are now Cat-O-Lympic ComPETitors! May the best kitteh win! Bogey is indeed very talented. You are right Pasha, I didn't notice that until you pointed it out! Good luck to all of you! It's a very strong field this year. May the best kitty win!